In fact, I'm fascinated by the jewelries worn by many people, men and women, on their arms and especially fingers. Have you watch Criminal Minds? 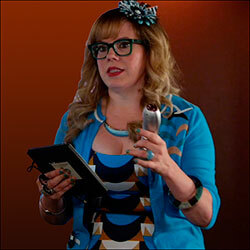 One of my favorite characters is Penelope Garcia, the bespectacled BAU's Technical Analyst played by Kirsten Vangsness. She has really big chunky and crazy jewelry pieces on herself. Next time you watch the drama, look out for the pieces on her fingers. Not expensive pieces but really dramatic. She changes them to match her colourful outfits so it's really interesting if you start to observe them. Have a look at her in the image below. Uniquely Gracia! Let yours be different too! Make them yourself and wear them on your fingers. Yes, not just solitary one but two and more. Flaunt them! Make a statement. Why? Because you are truly unique. Here are instructions for making them. Click on the link you are interested in and go straight to each how-to project and learn how to make them. Okay! Gather your jewelry supplies and begin to make your own unique finger jewellery pieces. A Bohemian piece for the free spirit you. An expandable piece with copper chain and colourful Indian glass beads The band is adjustable and very inexpensive so make a few and choose one to match your attire any time any day. Opaque as well as clear see-through gemstone clusters adorn this piece. Same adjustable band like the above one used so you can make these for anyone; fat or thin it's okay. 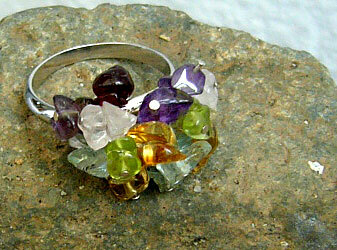 Just tighten or expand it will fits snugly on any finger. 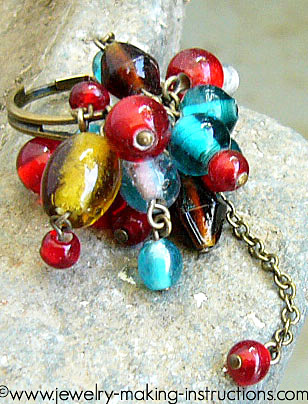 Choose your own semi-precious stones or just glass beads and create one-of-a-kind jewelry piece for yourself. Wire wrapping technique used here. 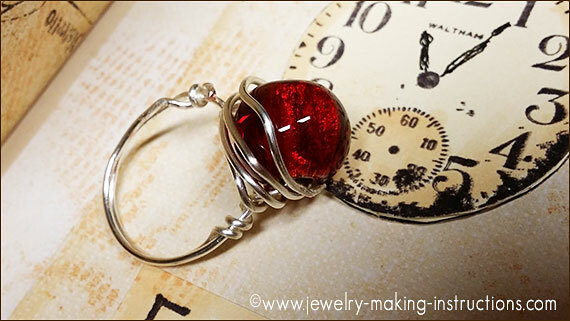 All you need is a unique stone and jewelry-making wire. I used a adequately big red glass stone. Love the brilliant red colour of the stone. Another one using the wire-wrapping technique. 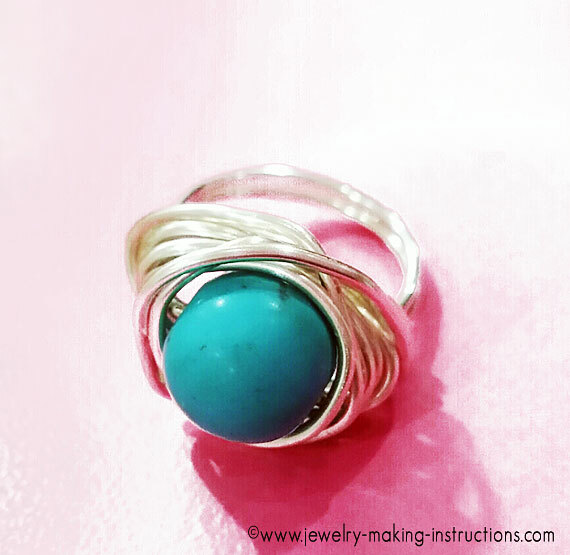 Here a turquoise stone is used. Really goes well together with silver wire.